The satellite speaker lights and subwoofer also offer 160W multi-directional sound complete with dynamic bass boost. Compact desk fans allow both slow and fast airflow, up to 5,000rpm. With two integrated motor drives and variable rotation speed, the wrist rumbler enables gamers to actually feel movement in the game, experiencing the action through vibration. Although it can take cues from the monitor, to amend the optimum result the system needs amBX-enabled (scripted) games, such as THQ’s popular Broken Sword: The Angel of Death, Codemaster’s Toca Racing Driver 3, and DEFCON from Introversion. Kuju’s Rail Simulator, to be published by EA and Gas Powered Games’ Supreme Commander, published by THQ, are both currently being developed as amBX games. 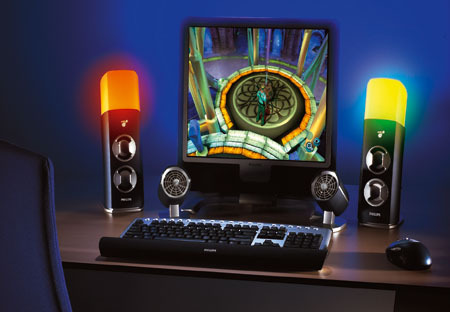 Philips offers four kits, including a ?199 starter kit which contains a directional wall-washer light, controller unit and satellite lights; and a Pro-Gamer Kit which includes a directional wall-washer light, a controller unit, satellite speaker lights and sub-woofer; and an Extension Kit featuring a set of desk fans and wrist rumbler.